This afternoon there will be a commemoration at the National Civil Rights Museum, outside the Lorraine Motel balcony where Dr. Martin Luther King Jr. was shot and killed 51 years ago today. It will begin at 4 PM, with a speech by keynote speaker Dr. Omid Safi and reflections by Dr. King’s colleagues, Rev. James Lawson and Rev. Jesse Jackson. The program will pause for a moment of silence and changing of the balcony wreath at 6:01 PM, 51 years to the minute since the shot rang out. The museum’s Hooks Hyde Hall will be the rain location. This event is free to the public. It’s opening day for the Memphis Redbirds. The Redbirds start their first homestand against Omaha with the first pitch at 7:05. The Pacific Coast League and Triple-A National Champion Redbirds will be welcomed prior to the game in a Players to the Line ceremony, and the PCL championship flag will be raised. First 2500 fans in the gate get a schedule magnet, presented by Southern College of Optometry. There will be select $2 domestic beers tonight, and $1 Polk’s Meats hot dogs. Enjoy a free appetizer at @TGIFridays with your game ticket! Good for one appetizer from the bar menu on game days and the day following the game. Just present your ticket to your server! Of course, looking out the window it appears that tonight’s season opener will get rained out. I remember how disappointed I was as an 8-year-old when I’d been looking forward to the Arkansas Travelers season opener for months and it got rained out. There are going to be a lot of sad kids in Memphis tonight, I am afraid. The Great American River Run, the half marathon that is part of the Memphis in May schedule, will see the King/Queen of the Hill Challenge return for 2019. Mile 10 of the half marathon is a run across the A.W. Willis Avenue bridge connecting Downtown to Mud Island. Fastest to make it across the bridge will win $500. The Commercial Appeal’s Jennifer Chandler writes that Malco at the Powerhouse takes dinner and a movie to a whole new level. You can get boozy milkshakes at Malco Powerhouse, or down the street at the Arcade. Pabst is expanding its line of beers once again with PBR Extra. It’s the great taste of PBR with a whopping 6.5% alcohol by volume. I may have had that info wrong about the April SMA meeting I blogged about yesterday. I’m now seeing that the April meeting will be April 9 at Old Dominick Distillery, and will be a preview of a festival to happen at the distillery the last weekend of April. Plans are in the works to spruce up Mud Island for Memphis’ 200th birthday. A 50-foot long “MEMPHIS” sign will be installed on the southern part of Mud Island. Walking paths, sunflowers, swings and lights will be added, and there will be a summer concert series. The Mud Island River Park will open to the public May 2. The Downtown Memphis Commission is in the process of trying to figure out what to do with the W.C. Handy house on Beale Street. Tours were given previously but the tour operator was forced out in February. For my readers who ride Bird and Lime scooters: I want to show you a photo and then challenge you to think about something. This photo was taken at the 100 Peabody Place office building’s front door, looking westward to the Main Street Mall. 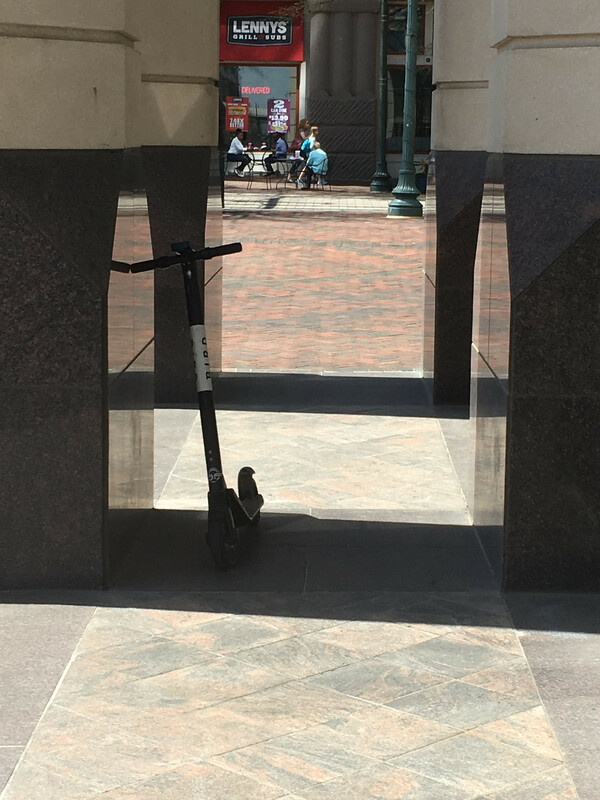 Here’s my challenge to Bird and Lime scooter riders: Every time you park a scooter, look at where you’re parked and ask yourself, “Would a person in a wheelchair be able to get by?” A wheelchair-bound employee in that office building would either have to get by that scooter, or face going down steps. I know those scooters are convenient, but let’s not be in such a hurry to get where we’re going that we abandon consideration for all of our fellow humans. 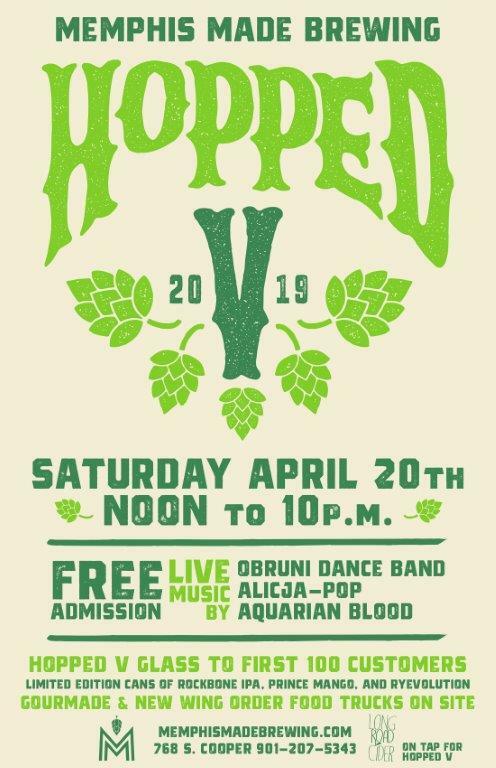 Memphis Made Brewing Co. has announced its Hopped V celebration the day of Saturday, April 20. The Blind Bear’s Totally ’80s party happens this Saturday night. Costume contest, photographer, drink specials, and ’80s music by DJ SuperBrad. FedExForum has announced that Celine Dion’s Courage world tour will make a stop at the arena on Sunday, February 9, 2020. Tickets will go on sale to the public Friday, April 12 at 10 AM. Loving Local, the annual fundraiser for Project Green Fork, has been set for Thursday, June 13 at Carolina Watershed. PGF works with local restaurants to reduce waste, conserve energy and water, and eliminate pollution. Come enjoy food and drink from PGF-certified restaurants and breweries, and live music by Marcella Simien. Memphis 901 FC travels to North Carolina for a 6 PM Saturday game against North Carolina FC. The Bluff City Mafia will host a watch party at the Brass Door beginning at 5:30 that evening. Kranch is a thing now. It’s half ketchup, half ranch. I’m guessing that as soon as he becomes aware of this product, Donald Trump will request some kranch for dipping his well-done steak. That’s all for now. Stay dry, everyone. Back tomorrow with more news.